The nurses' strike in Vermont has ended. Their target was a health care model that systematically endangers patients. Last Thursday and Friday, the most frequent sight in scenic Burlington, Vermont, was not the usual horde of summer tourists vacationing by the shore of Lake Champlain. 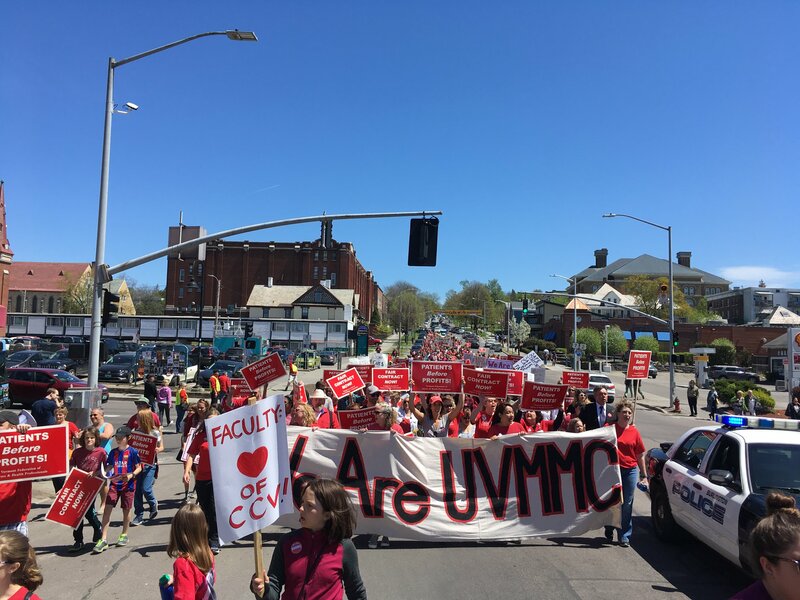 Instead, it was 1,800 nurses striking against their employer and the largest hospital in the region, the University of Vermont Medical Center (UVM-MC), over issues affecting thousands of patients. During their two-day walkout to protest stalled contract negotiations, members of the AFT-affiliated Vermont Federation of Nurses and Health Professionals (VFNHP) donned red T-shirts and massed by the hundreds, at two midday rallies and on picket lines, that were greeted with enthusiastic honking by local motorists. On Friday night, they paraded, about 1,500 strong, down the hill from the UVM campus, through residential neighborhoods and Burlington’s business district, ending up at City Hall Park. At stake in this still unresolved struggle is what kind of “not-for-profit” institution their campus-based employer is going to be for nurses and their patients. Will its financial priorities include nurse retention and safe staffing levels or just more splurging on executive compensation and medical empire building? According to the nurses’ union, UVM-MC spends more than $11 million per year on its top fifteen administrators, including $2 million for CEO John Brumsted and $1 million for hospital president Eileen Whalen. When strike supporters gathered outside the hospital complex last week, they could see construction crews working on a $189 million addition to the medical center. Management is making plans to acquire more local physician practices and smaller hospitals, both in Vermont and neighboring upstate New York. During the walkout, Whalen reported spending $3 million on six hundred replacement nurses provided by Autumn Consulting Services, a Colorado-based firm whose niche market is strike breaking. In contract talks before the strike, management negotiators consistently defended the medical center’s pay inequity. Nurses were informed that, for the purposes of setting executive compensation, UVM puts itself in the same big league category as Yale New Haven hospital, the Mayo Clinic, and Massachusetts General Hospital in Boston, which is affiliated with Harvard Medical School and Partners Healthcare. The VFNHP estimates that six hundred of its members have not gotten a raise in nine years. According to the union, UVM-MC faces high RN turnover and a nursing shortage because Vermont ranks forty-seventh out of fifty states in RN pay levels. The issue of money is directly connected to nurse recruitment and retention and patient safety. In any hospital, registered nurses and nursing assistants make up the largest percentage of the labor force because patients are not admitted to hospitals unless they need nursing care; and today, with more technological interventions and intensive monitoring, they need more than ever before. Nurse practitioners play an increasingly important role in the delivery of hospital and clinic services, due to a nationwide shortage of primary care physicians and strict resident duty hour restrictions. When a nurse doesn’t have time to turn a patient in bed, that patient can develop an excruciating and costly bedsore. When a nurse can’t give prescribed medication on time, a patient may develop a serious infection or suffer from unremitting pain. When a nurse is running among eight different rooms, that nurse will not have time to notice a subtle change in a patient’s condition that indicates a catastrophe is about to happen. It also means that nurses are rushed past educating patients about how to stay healthier. Among those out-of-state RNs rallying behind the VFNHP last week in Burlington were members of the Massachusetts Nurses Association. The MNA is sponsoring a ballot measure this fall that would limit the patient loads of Bay State hospital nurses. California is currently the only state in the nation with minimum nurse-to-patient staffing ratios. When other state legislatures have tried to follow suit, powerful hospital industry associations have blocked passage of all similar bills. This has forced unionized RNs, like those represented by VFNHP, to seek contract language limiting how many patients can be assigned to a nurse at the same time. The shift to a cost control approach to managing illness, injury, and disease has been thoroughgoing and is now all-pervasive. This approach shortens patients’ length of time in the system (particularly as inpatients) [. . .] As patients get sicker, however, more nurses are not assigned to meet their increased requirements for care. The cost control model guarantees profits for hospitals and insurers by pushing patients out of the hospital earlier — making them sicker in the long run — and pushing nurses to do more with less. That’s what administrators are arguing for when they reject safe staffing. In this way, the Vermont nurses’ insistence that the choice is between “patients” and “profits” isn’t just a slogan. It’s an empirical description of what is blocking quality patient care in Burlington and beyond. As MacMillan warned her colleagues during the strike, “We have an extended, protracted struggle ahead. We are in a power struggle with very powerful people who have deep pockets.” During their first walk-out ever, the Burlington nurses took a big step toward leveling that playing field with a strong showing of internal solidarity and community support. Hopefully, their fight will show results when bargaining resumes on July 24.